Welcome to Melba House Boutique Bed and Breakfast in the World Heritage Blue Mountains. Situated in the heart of Katoomba, in a quiet street only minutes from the village, views and sights, Melba House offers luxury at affordable tariffs. Enjoy your own private suite in a grand Edwardian weatherboard mountain home built C1905, perfect for your Blue Mountains experience. Melba House combines all the charms of the early 20th century - wood burning fireplaces, high decorated plaster ceilings, intricate woodwork - with 21st century conveniences, including central heating and wireless internet access. A beautiful wide timber wraparound verandah is the perfect place to enjoy your gourmet homemade breakfast on a sunny morning. The three Deluxe Suites, each with en suite and named after a famous Australian Dame, offer self-contained privacy. If romance is in the air, your suite is a quiet and secluded hideaway. The Suites have been recently updated with luxurious Laura Ashley furnishings. After a peaceful night’s sleep you can enjoy a gourmet breakfast delivered directly to your suite or to the front verandah. There’s no need to see another guest your entire stay, if that’s what you prefer. Melba House Boutique B&B is rated 4.5* by AAA Tourism and is an exclusive adults retreat, well known for warm hospitality and sumptuous mountain gourmet breakfasts. Free wireless internet is available in all suites. We cater for all dietary requirements including Coeliac, gluten free, dairy free, vegetarian and vegan. 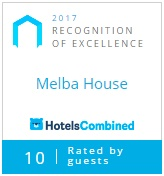 Melba House is a non- smoking property. Pets are adored but only the incumbent American Cocker Spaniel, Issy, is allowed. Melba House Gift Vouchers, valid for 12 months from date of purchase, are available for special occasions. Please refer to our terms and conditions. Historic Katoomba is the heart of the most spectacular natural attractions that make up the Blue Mountains World Heritage National Park, including the Three Sisters at Echo Point, only minutes away from Melba House. Many walking trails begin in Katoomba with easy access for all levels of fitness. Not to be missed is the thrill of the Scenic Skyway and Railway for 360 degree views over the Jamison Valley. Stylish, contemporary food is on the menu at Sydney-style cafes and restaurants located within an easy walk from Melba House. Visit the Three Sisters and stay with Three Dames!